‘Yellow Vest’ Protests in Paris Prompt Security Meeting: Less than a week after US troops used tear gas against asylum seekers at the US-Mexico border, President Macron of France ordered its use on his own citizens. The ‘Yellow Vest’ protests began last month and were sparked by rising fuel prices. Over the weekend, at least 75,000 protestors (according to interior ministry figures) took to the streets to call for Macron’s resignation and a halt to increases in taxes on fuel. 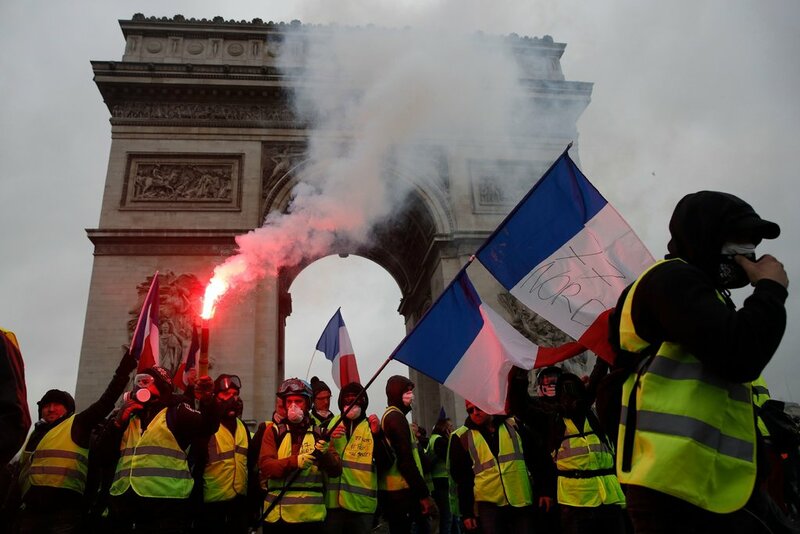 According to polls, these protests are supported by two-thirds of the population; protestors claim Macron has ignored rising living costs and are demanding the broadcast of public talks. After the injury and arrest of hundreds of protestors, Macron held a security meeting to discuss potentially declaring a state of emergency. Zimbabwe’s Economic Crisis Embroils Leadership, Threatens HIV Patients: Since the removal of President Robert Mugabe and the electoral victory of Emerson Mnangagwa, fuel prices – among other costs – have continue to rise in Zimbabwe. With Mugabe’s health declining, many Zimbabweans are doubting the efficacy of the change in leadership they celebrated just a year ago. As former challenger, Nelson Chamisa, leads fresh protests in Harare, medical professional worry that shortages in supplies and cash will prevent patients from continuing treatment and lead to drug-resistant forms of the disease. CNN Uncovers Khashoggi’s Private WhatsApp Messages: Since John Bolton defended his choice not to listen to the audio evidence of the murder of Jamal Khashoggi earlier this week, CNN has since uncovered hundreds of the Washington Post columnist’s private WhatsApp messages. According to CNN, the over 400 messages to Saudi activist Omar Abdulaziz show a “progression from talk to action — the pair had begun planning an online youth movement that would hold the Saudi state to account.” Despite dominating headlines for over two months, it remains to be seen whether or not new information will lead to concrete action against the Crown Prince of Saudi Arabia, Mohammed Bin Salman. Movie screening and panel discussion on the America’s deadliest drug crisis with the NYU College of Global Public Health and John Brademas Center of New York University. Attendees can register here. The Studio Museum in Harlem will be premiering the film Alternate Endings, Activists Rising. Panelists will discuss the creative contributions to AIDS in New York and the American South. Tickets are complimentary; guests can register here. For Listening/Watching: From director Alex Winter, The Panama Papers, documents the 9-month, widespread collaboration of journalists worldwide to decipher and report on the now infamous Paradise Papers. Recently released on the Epix channel and coming soon to Hulu, the documentary film is sure to be compelling for all those interested in journalism and global corruption. Winter was recently interviewed by Jeremy Scahill for the Intercepted Podcast. This week’s Monday Briefing was brought to you by Sam Broadway.